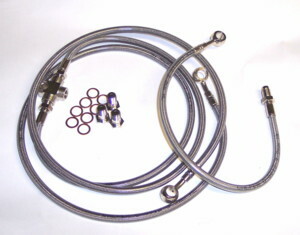 Galfer Front Braided Stainless Brake Lines - Stock length, 3 - line Galfer braided stainless steel front brake line set. These lines will improve brake feel and they look great. Clear plastic coated to prevent scratching of bodywork. Comes complete with lines, tee fitting and banjo bolts/washers. Price does not include shipping. 50 state shipping for this item will be $6. When ordered with other products, the shipping cost will be calculated based on the weight of the total order.